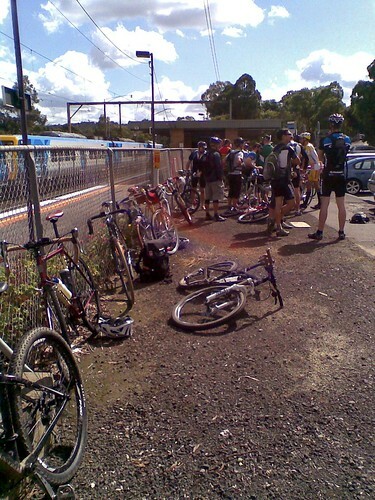 The weather was looking pretty fine as riders filtered in from all directions and gathered in the car park of Hurstbridge train station. There’d been quite serious flooding in the area in the previous couple of days but Sunday morning saw blue skies and mild temperatures. A quick recon mission up to Mittons Bridge Road found that there was some damage and debris on a couple of the bridges we’d encounter on the course but nothing that would stop us from riding. All systems were go. 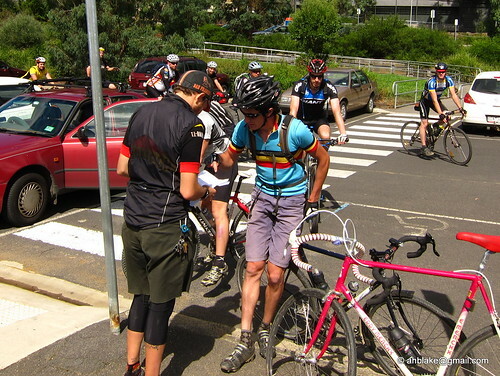 Fifty-one riders signed up and were given a cue sheet and map that would guide them around the backroads nestled beneath the Kinglake Ranges. 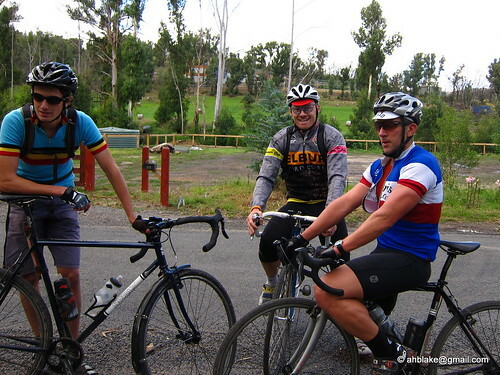 There were plenty of laughs as we all milled around and ogled each others’ bikes and chatted with old friends and new alike. And there were plenty of talking points lying on the ground and leaned up against the fence - bikes of all descriptions - MTB, CX, roadie, tourer, SS, fixed, steel, alu, carbon, with tires ranging from 23mm to 2.3 inches. There was much discussion about gearing and tires and tire pressure and a lot of general bike perving. The clock struck eleven and a quick briefing was given - “Share the roads, it’s not a race, have fun, see you back here!” etc. etc. - and then it was on. At which point the rain started coming down. Fortunately it was only an isolated shower (the first of many!) and it didn’t dampen anyone’s spirits. The terrain was quite rolling and the first reasonable dirt climb had many people walking. A taste of what was to come! Oh well, there’s worse things to do on a Sunday morning than take a pleasant stroll through the countryside (pushing your bike). As the day wore on, the intermittent rain showers seemed to give up and we were left with warm sunny conditions. 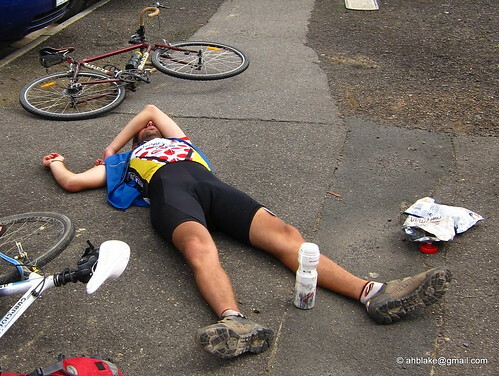 The temperature and the climbing affected riders differently. Some seemed energised by the challenge and raced through the checkpoints, clearly eager to see what was around the next corner. 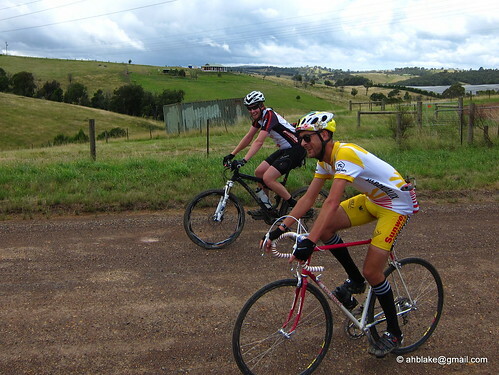 And some seemed to be flagging in the heat and quick to reach for the gear shift when the road started climbing again. Stories emerged of encounters with wildlife - kangaroos, eagles, three-legged dogs - and a head-on collision between two cars was witnessed on Bald Spur Road (not cyclist-related, no-one injured, temptation to take photos tactfully resisted). Word from the finish line was that the lead group had barrelled back into Hurstbridge train station carpark for a curb-bunnyhopping finish after working together throughout the day to push a solid pace. The rest of the field was still out there enjoying the countryside. 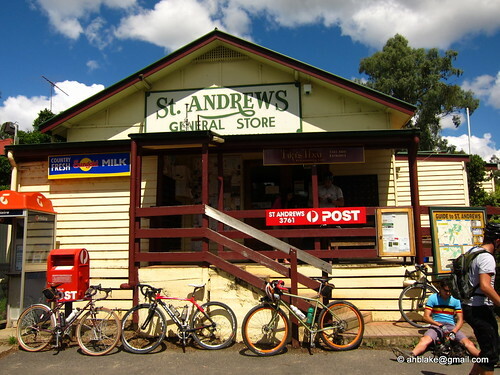 Though it appears that some had enjoyed the countryside enough for one day and the temptation to take a shortcut from St Andrews back to Hurstbridge on the main road was too much to resist. Apparently some got “lost” in a pub around about here - I didn’t think the map was that misleading but hey, if they’d got that far they’d certainly earned a beer or two. Thanks to everyone for turning up and having fun and best wishes go out to Ronny who came a cropper on the sharp, slippery turn into Doctors Gully Road. If you’ve got any feedback or suggestions for the next event, feel free to email us at melbournegravelgrinders@gmail.com. We’re currently looking to run one of these every second month. 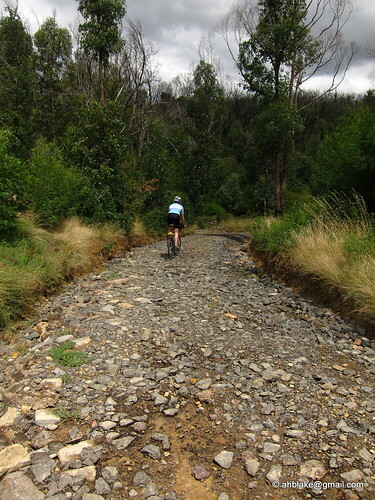 The next one will probably be at the start of April and we’re looking at a start/finish at the Basin - right at the foot of Mt Dandenong - which some of you may know as the start of the popular climb called the “1 in 20”. What was the "travesty" because I bet I can beat it! GT Tachyon. Effin' rad. Not all that different in concept to the Rawland and other monster cross type bikes. 700d tyre size or something odd like that right? Full coverage mud guards and low rider bags are a nice touch. Yup, 700D converted to 650B, now a front loaded tourer. It even has track ends on the fork for adjustable trail.